Fountains can bring aesthetic appeal and relaxation to any backyard pond. 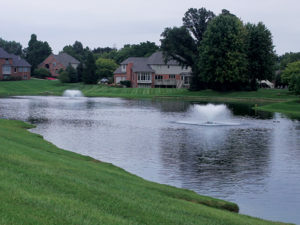 Let us help you determine the best size fountain for your pond. 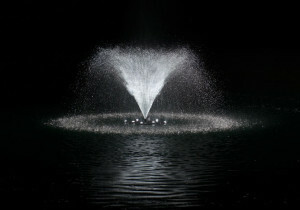 Multiple size fountains are available each with an optional light kit to extend viewing into the evening. In ponds less than 6’ deep fountains can also provide some surface aeration and will aid in water circulation and clarity. Our Techs will remove all makes and models of fountains and complete an onsite inspection including amp draw, power cord inspections and proper operation. Once removed and inspected, fountains will be tagged and transported to our facility where they will be cleaned and evaluated for repairs if needed. We will provide a written estimate for any repairs necessary such as oil changes, damaged cords and warn bulbs so repairs are complete and units are ready for reinstallation in the spring. All units will be stored at our facility for the winter. 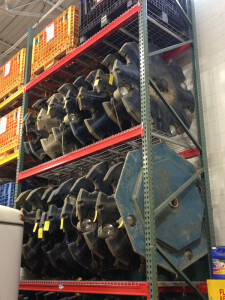 Our techs will transport the fountain back to the pond and assemble, install and start unit and set timers.